It was considered big news last week that House members Maxine Waters of the Financial Services Committee and Al Green of the Subcommittee on Oversight and Investigations have requested that the Government Accountability Office (GAO) launch an investigation of “regulatory capture” on Wall Street. That news broke on Friday, one day after Senator Elizabeth Warren grilled the head of a Wall Street self-regulatory agency in a Senate hearing on a new study showing that stockbrokers with serial records of misconduct are allowed to remain in the industry. Warren also cited another recent study showing that even when investors prevail in arbitrations against bad brokers, they may never get paid. According to the study, over $60 million in fines owed to investors have not been paid since 2013. What the public doesn’t know is that for over 30 years, the GAO has been investigating these identical problems on Wall Street and making recommendations for cleaning up the mess. After 30 years, it should be abundantly clear that reading GAO reports and shaking one’s head isn’t getting the job done. Serious, radical reform of Wall Street is necessary and that means eliminating crony regulators and the entire self-regulatory system. Again in 1994, the GAO looked into unscrupulous broker activity on Wall Street. The study found that there was the perception that the SEC and NASD were “lenient” in disciplinary actions and that some brokers that had been barred from keeping a license to make securities transactions were entering other sectors of the financial services industry. 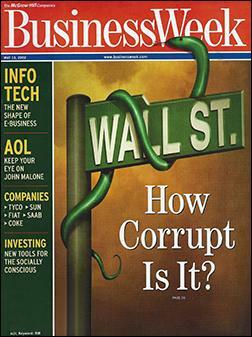 A year earlier, BusinessWeek had asked this simple question on its cover: “Wall Street: How Corrupt Is It?” with a snake curled around the street sign suggesting the answer. As for the regulators and Congress tolerating investors being victimized twice – first by the unscrupulous broker and then when their arbitration award is not paid – (should the investor be so lucky to have his or her case heard before non conflicted arbitrators), the GAO has been investigating unpaid awards for almost two decades with nothing to show for it. And here we are, 18 years later, with Senator Warren asking the head of NASD’s successor, FINRA, what he plans to do about $60 million in unpaid awards to investors dating back to 2013. FINRA also likes to brag about how much it has done to help investors by setting up BrokerCheck, where investors can check to see if their stockbroker has a disciplinary history. But the problems here are myriad. We put in a broker’s name whom we know was licensed and employed at Smith Barney as a retail broker over a long period. The broker doesn’t even exist in the database. Nor does he exist in the Investment Advisor lookup. He just doesn’t exist. Brokers with five, six and even seven arbitration claims against them are still employed at the same firm. But you wouldn’t know that from the BrokerCheck system which shows serial employer name changes when it is actually the same firm. So the uninitiated at the GAO or SEC might assume that the broker is being fired for misconduct and moving to a new firm when he is actually sitting in the same seat for three decades without any serious disciplinary measures being taken because he is producing large commissions for his firm. Congress has known for decades that self-regulation doesn’t work. And installing Wall Street’s former lawyers or Wall Street executives at the SEC doesn’t work either. Tolerating the systemic conflicts of interest at the New York Fed, the sole regulator of Wall Street bank holding companies, has been catastrophic to the U.S. economy. Congress fully understands what’s causing regulatory capture; it just doesn’t have the guts to do anything about it but kick the can down the road to the GAO. As far as electing another U.S. President whose campaign has been financed by Wall Street and expecting a different outcome, let’s hope and pray most Americans are smarter than that.